An expatriate rediscovers the country he left behind and lets the chips, including the one on his shoulder, fall where they may. The author, a former teacher who left England somewhat accidentally for New Zealand, returns quite calculatingly after 18 years to write a book about what he will discover. His mission is to recreate a 1926 motor tour taken by once-popular British writer H. V. Morton, who drove “a Bertie Wooster car [and had] Bertie-Woosterish encounters that he reported in Bertie-Woosterish style.” Morton’s aim was “to find the real England,” and Bennett follows in his tire tracks from London west to Cornwall, Wales, the Midlands, the industrial North and back again. This circuit encompasses some of the country’s most visited locales, including those depressingly “tarted up” (in the author’s view) for the tourist trade. Bennett provides a candid impression of these byways and the people who now live there, waiting to welcome—or not—the casual visitor and share—or not—their revered—or not—heritage. The landscape has changed since the days of Morton. The growth of street crime is reflected in police warning signs posted in even the most secluded villages. The culture of the motorway itself, with BMWs and Volkswagens streaming off the major routes into local car parks, has been permanently altered. Bennett travels across empty windswept moors and private green glades. He visits pubs and has random encounters in the streets. In the face of waning traditions and modern tensions, he still manages to capture the essence of England. 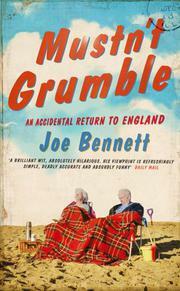 Acerbic but entertaining: a good read for Anglophiles and prospective visitors.